It is just possible that the name ‘Sarnies‘ may suggest a speciality at this cafe in Telok Ayer St. Singapore. And the sandwiches are definitely very good (I happened to visit one lunchtime), but don’t let this deceive you, the coffee is very good too and indeed Sarnies has been listed as one of the top 10 cafes to visit when in Singapore. 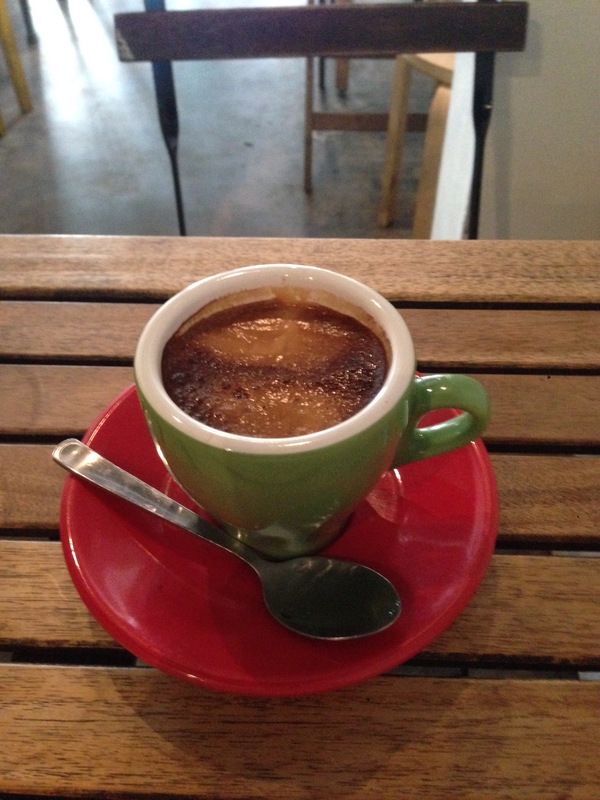 Sarnies operates from an old style ‘heritage’ building near the central business district in Singapore. This style of “shop-house” used to be ubiquitous in Singapore but as Singapore has developed so the tall buildings of the “CBD” now tower over these remnants of Singapore’s past. The authorities though are keen to preserve their heritage and so many of the buildings have been carefully restored so that the exteriors are fairly faithful to the original. The interior has plenty of table space for you to enjoy your coffee (and sandwich of course) and watch the goings-on around you. Complementary water is available at the bar while you wait for your coffee and sandwich to be brought over to your table. Inside, you can see how the demands of modern living have changed the architecture of the shop-house. Above the door, and along the window were a series of vertical timber railings. These date from the construction of the house and were presumably to assist with air ventilation in a time before air-conditioning. 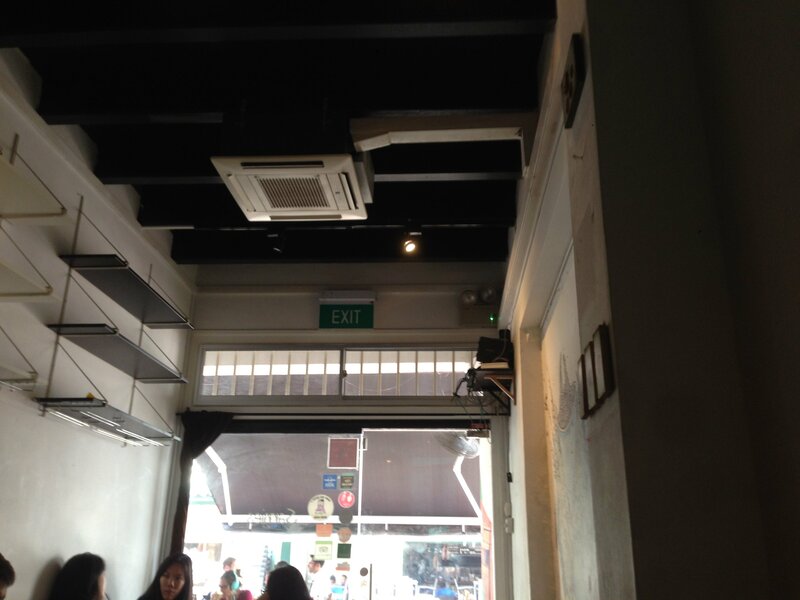 They work because hot air rises and so by putting an opening – a vent – near the ceiling, the hot air in the building will rise and leave the interior to be replaced by the cooler (it is never cool in Singapore) air from outside. Unfortunately, the temperature in Singapore during the day time is in the 28-33C region and so this method of cooling is not as efficient as air conditioning which is why the vents are now covered in glass. The air-conditioned interior also means that the door of Sarnies is kept closed at all times, ensuring that the air conditioning is as efficient and cool as possible (though seats are available outside should you want to sit in the heat). Air conditioning of course needs a lot of energy in order to work. The basics of air conditioning work on the same principles as those that cool your coffee: When a liquid evaporates into a gas it takes energy from its environment and thereby cools it (think about alcohol – or sweat – evaporating from your hand). The issue with air conditioners is that this is a continuous process. The liquid that is evaporated within the air-con unit cooling the room is compressed and re-condensed in the air-con unit outside the shop, in a process that consumes electricity and generates heat which is transferred to the environment outside the shop. The process uses a lot of energy (and therefore generates a lot of carbon dioxide emissions), indeed one organisation in Singapore calculated that more than 60% of their energy consumption on one campus was due to air conditioning. As cities use a lot of energy, clever design and engineering of the buildings in cities can be used to decrease the carbon dioxide emissions of cities and so help to mitigate the problems of climate change. The C40 is a group of more than 75 of the world’s largest cities that work together to find ways to use urban design to combat environmental problems. Perhaps it is in developing more energy efficient lighting systems or, in the case of the UWCSEA in Singapore, designing their new buildings so that they use air conditioning more efficiently and therefore less wastefully, both in terms of CO2 emissions and in economic terms. As I was sitting enjoying my Sandwich and coffee in Sarnies, a customer coming into the cafe left the door open. As the hot and humid air started to blow in from outside, the woman sitting near the door closed it to keep the cold in. This small gesture, almost completely opposite to that which I experienced in winter in London last year, helped to ensure that the air conditioning unit did not have to work harder to keep the cafe cool. A small action but one that helps save energy and so the planet, even if just a little bit. If only more of us did this. 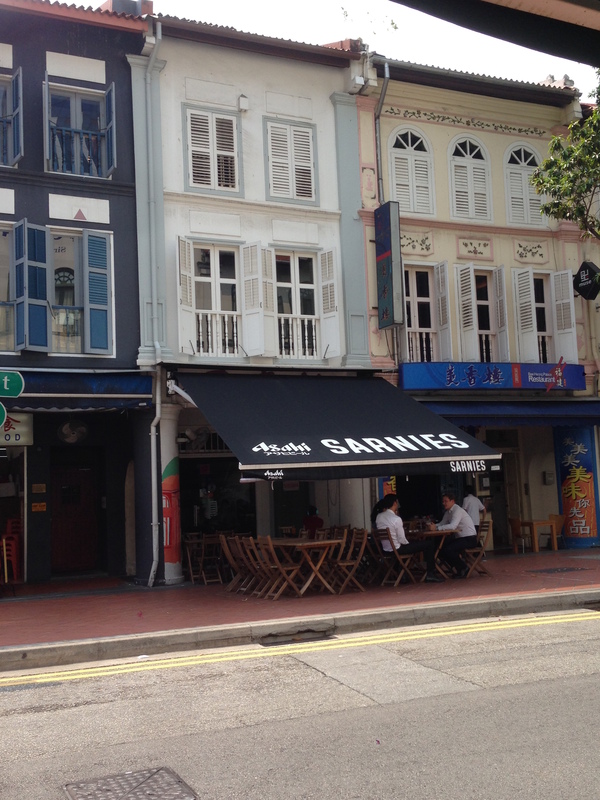 Sarnies is at 136 Telok Ayer St. Singapore.